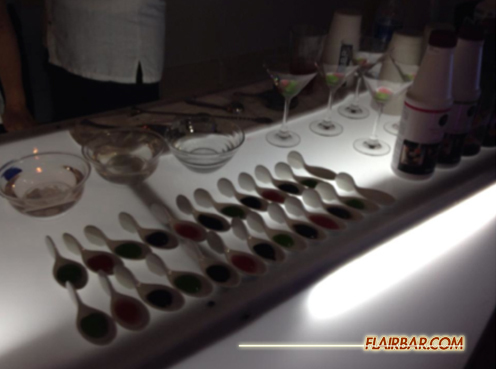 Home / Articles / Mixology & Flair Bartending in Singapore! 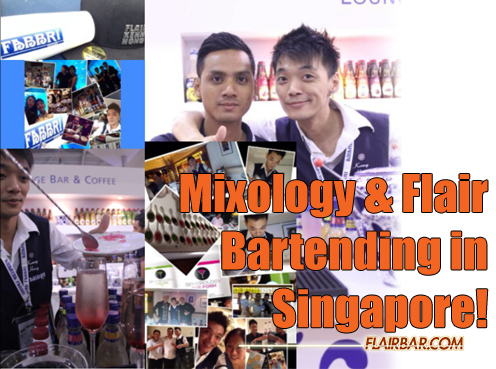 Mixology & Flair Bartending in Singapore! A very interesting topic to talk about. First of all, let me introduce myself. My name is Kenny Hong, I’m come from a small town from Perlis,Malaysia. 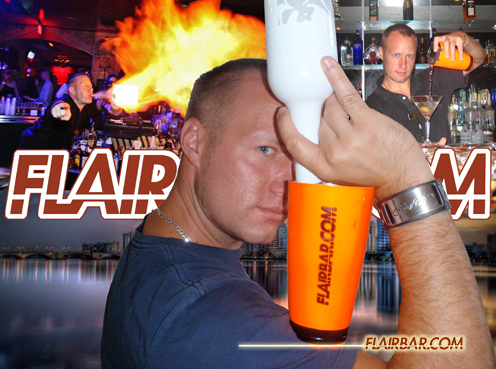 I started my bartending career when i was 18 in 2005 at a Flair Bar and cafe in Penang, Malaysia. Came in as 1st runner up at my 1st competition on 2007 and won my 1st champion title in the Lion City, Singapore on 2008 Bacardi Martini Grand Prix(Working Flair Cate- gory). My 1st overseas competition was to the World Bacardi-Martini Grand Prix(Working Flair Category)in year 2008, held in Torino,Italy. Since than I’ve been practicing and trying to perfect my knowledge of bartending. I’ve been working in Singapore from end of 2007 at Ministry Of Sound Singapore till now at club Dream. I will be soon joining Fabbri 1905 as Brand Ambassador, I believe this opportunity would allow me to better myself as a bartender and excel in this industry.! ! I hope to travel around the world to participate in more bartending competitions through this I would be able to exchange ideas and techniques with the different bartenders around the world. Bartending is a never ending cycle of learning from one another, I believe no one’s the best and there’s always more to be learnt, either through experimenting or through exchanging of ideas. Let’s start with the general information from everybody. Mixology is ‘’the art of creating new drinks, or coming out with a new method of making or mixing drinks etc’’. Mixologist more than often studies ingredients in a more in depth manner. Some do molecular cocktails also known as Molecular Mixology, or some even ‘cook’ the cocktail, they call themselves bar chef. Mixologist through their experimenting, often come up with new methods of mixing cocktails. Mixology has become a more common used term in recent years and is generally accepted to be a refined, higher study of mixing cocktails and drinks than the everyday actions of bartender. This definition and it’s use is one of much debate in the bartending community, usually because of the impression it leaves that a mixologist is better and more skilled than a bartender. This isn’t neces- sarily so. Neither is “better” than the other and each require a different set of skills, but then again the two titles can be interchanged. A bartender needs to have a variety of skills which are highly important and some that the mixolo- gist may not develop or use on a regular basis. In general a bartender needs to know a lot of common,international and popular cocktails, serve many people at once, think quick and be the ultimate people person. The mixologist tends to focus on the art and craft of mixing cocktails, studying the classics, concocting new and exotic drinks, experimenting with lesser known distilled spirits and mixers, and, overall, pushing the limits of classic bartending. Again, these distinctions are the generally accepted differences between the two roles and are meant for clarification. In my view, if you want to be called a bartender, do it and if you want to be known as a mixologist, you may do so. Also Known As: Bar Chef, Cocktailian, Bartender, Bartending, Mixicologist! The word ‘’flair’’ can hold different meanings. For example, a special or instinctive aptitude or ability for doing something well, or stylishness and originality.! Flairers take many years to perfect their moves, and are constantly inventing new moves to keep up with their competitors. Flair is considered as a type of bartending entertainment, it involves guest participation and a certain charisma from the bartender to draw the crowd. All Mixologist and Flairers are proud individuals, but let’s not forget we are all under the same um- brella as bartenders. We all need a bit of both skills to be able to excel in our job, so we’re not that different after all. We just have different interests and different specialties. Some of us are luckier, we have a gift that allows us to excel in both entertaining guests and making great cocktails, whereas some of us might just lack a little on one. This is where practice and learning takes place. I always believe if one never stops learning and improving, there will always be a day they can come out top dog. Conflict often arises when mutual understanding is low, it’s only understandable. But if even bar- tenders can’t understand and embrace the different types of categories there are, how would we be able to let the public understand, and enjoy bartending as an art. Be it a bar chef, a mixologist, a bar master, a bar man, a Molecular Mixology or Flairers, ‘WE’ mix drinks and WE are bartenders. The only difference between all of us is we use different methods or ideas to present the product that we serve to our guests. We are always cracking our brains to come out with a brand new idea, menu, drinks, method or creation to impress the world. For me, I love flairing, I love the art of entertaining and I’m proud of it. People often classify me as a Flairer. However I like to keep myself updated, I often learn from different Mixologist & Flairers not only in Singapore, but also from around the world. Many would say I’m lucky, more privilege to be able to get to know so many bartenders around the world. But they forgot, I was once new too. So my advice for the many aspiring or new bartenders out there is to research, be it on the inter- net, cocktail book, Facebook friend, website, magazine etc. That are countless of ideas and meth- ods on how to create and impress the world, and from there learn and experiment. Most of all prac- tice, practice and practice. One day you’ll achieve what you set out to achieve, but even then, con- tinue to be humble and continue to strive for your best. Bartending Scene in Singapore! Like many countries around the world, Singapore do have our fair share of both Mixologiest and Flairers. We are never too far from where we started, most of us are often seen in the food and beverage industry.! ! Recent two year, some of the flairer also have upgrade themselves not only on flair, also on mixol- ogy, including myself but is too early for me to stop flair. I might just flair till the day that i can’t flair.! ! Singapore is still a young nation, and has many opportunities to expand and grow. We have many hidden gems just waiting for the world to discover.! Many worldwide individuals had shown interest and support for the bartending scene in Singapore. One example would be Mr. Nicola Fabbri (CEO of Fabbri 1905), a strong supporter of the bartend- ing scene in the world, he is a man of taste and loves to travel around the world looking for bars to try out their distinct cocktails.He also appreciated not only mixology and also flair bartending. He was recently in Singapore and managed to find time off his schedule to visit the many new cocktail bars here, some of which is Fordham & Grand, 28 Hong Kong Street and Manor Bar etc. Fabbri 1905 recently also get some of the famous bartender in the world to drive up the flair & mixology industry. The bar man like Alessandro Cattani, Moizes Barros, Danilo Oribe, Vladymir Buryanov, Pedro Garcia for Europe country, also for a few famous bartender around Asia country. With this I believe Singapore would be a country to look out for in the near future. Though in its infant years, the cocktail (mixology) scene in Singapore has quickly captured the ranks within the world’s 50 best bars in 2011. With its most recent achievement in 2013, with 28 Hong Kong Street securing 10th place and Tippling Club in 45th. Despite being a geographically small country, the passion of its bartenders in cocktail perfection and creation has sparked enough interest in Singapore and the world to take notice. Bars in Singapore have taken pages in tourism articles from Japan, Taiwan and other parts of the world. Currently, varying forms of cocktail bars, ranging from classic-driven (Jigger and Pony, 28 Hong Kong Street) to mixology bars (Orgo – which deals mainly with fresh fruit cocktails) to general cocktail bars (the Library) and molecular cocktail bars (Tippling Club) has sprung up ubiquitously around the island. Drawing in full-house crowds, food bloggers, lifestyle writers, it seems the local demand for quality cocktails is on the rise. Of late, cocktails which display traits of “local flair” have gotten much attention. “Tak kiu”, the “Kaya Martini, “Laksa Boy”, “Teh Halia” and “Chendol” have been created which suggest the localization of cocktails. With the support of the bigger brand principles, promotion of Singaporean bartenders to the global platform have been rife. Din Hassan from Manor Cocktail Bar, Mark Graham Thomas from Bacchanalia and Sam Wong from Ah Sam Cold Drink Stall, are but a few of the bartenders which have represented this inconspicuous island in international and training events and bar con- sultations in Jakarta, brand promotions in Taiwan and other bar-exchange programs.However that is still a number of good bartender and good cocktail bar around Singapore, a few example like David Yeung from Fordham & Grand, Zdenek Kastanek and Peter Chua from 28 Hong Kong Street, Caryn Cheah Hsiao Fen from Barkode Cocktail Bar, Shawn Kishore/F&B Consultant etc. 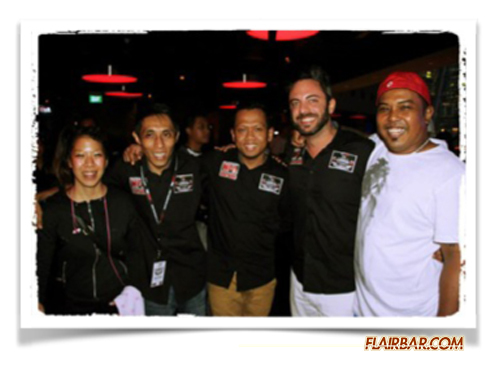 Singapore flair industry is not so huge & active, compared to 10-14 years back than during our legend bartender Fifi Faris, Mac Azaman and Mamat Suali time. Due to some of the reason and changing of time,now we are still looking for a better platform to educate the public on this form of art and attract new blood who are interested flairing. We normal- ly train in outdoors, some of the schools or at the Sentosa Beaches.I believe with constant educa- tion and word of mouth, in the near future we will have more interested parties and hopefully a bet- ter venue and platform to hold classes. 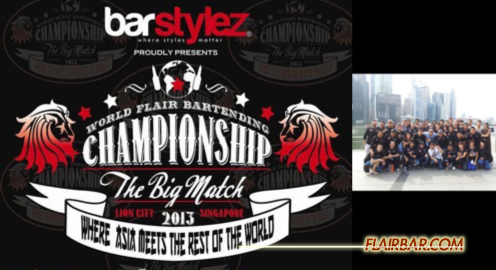 In the recent two years, Team Barstylez, a Singapore based event group, organised the FlairJam competition and ‘’Barstylez The Big Match Asia Meet The Rest Of the World 2013’’ competition.The participant also include Adam Brancńczy, Václav Abraham, Alexander Shtifanov and most of the famous bartender around Asia. The latter is probably the biggest flair competition in Singapore. It showcases what the Singapore Flair industry can do. These competitions allows us to reach out to the public and attract more awareness for flairing, and from there we had gained several new aspiring bartenders, alliances and contacts. Other than hosting competitions, we also work closely with the local bartender asso- ciations or schools like Association Bartender Sommelier Singapore! and Schools like Shatec. Beside that we also have a support from all around Asia or world bar- tender organisation like World Flair Association, Bar Soul/Taiwan, Flair Iron/Hong Kong, Flairline/ Indonesia,BarPro/Asia,B Evolution, Btc, Bar Angel/Thailand and many more. Barstylez The Big Match 2013!Where Asia Meets The Rest Of The World! As a bartender, there’s so much more then mixing a good cocktail, there’s also good service, the understanding of the music genres, the entertainment value of which your can provide to your guests and many more. We also have the responsibility to pass down the art of bartending to in- terested parties and training them. But most importantly, is to serve responsibility. We are in this industry and community where alcohol is involved, with the right amount, people would be able to better enjoy the bar scene and ultimately get home safely. With my bartending background, I personally think that being a bartender probably is the best job in the world. We meet and deal with different people from around the world. Everyone has their own stories, by interacting with them, we get to grow as an individual as well. But the best part is we have fun, and we’re doing what we love. However we need more support on the bartender industry, with everyone’s support we give the public more insight of what we do and hopefully make this industry grow. Last but not lease,thank you to Mr.Rob Husted for giving me this chance to write bout this article. (Mr.Rob Husted From www.flairbar.com. You can always agree or disagree with my opinion. Just be yourself, do what you love and enjoy it while it lasts! We bartender! We Rock! Bartender always make the world different. Remember the Bar rules. ! 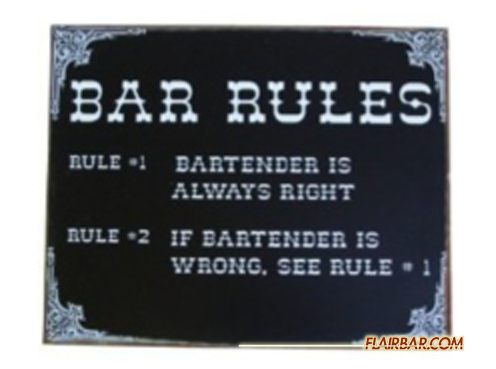 Rule #1 Bartender is always right, Rule #2 If Bartender is wrong,see rules #1. ! And my personal Rule #3 We bartender have to make it RIGHT!! ! Be Humble, Be Original,Be Creative,Be Nice,Be Who You Really Are!We Can Always Make Things Differently! ! ! Happy Bartending to every Bartender around the world!Keep mixing,flairing, never give up what you love to do,no matter what other people say!Peace!